Excellent location and property. A little chilly at night times as wood burner would not stay in for long but at the end of the day it’s camping !! Loved it and so did the children and the dog. Very welcoming owners 10/10 :). Perfect hosts, good mix of friendly and knowledgeable of the area, but left us too it. The complimentary afternoon tea was a real treat after a long journey! And had a thoroughly relaxing week! We loved our stay in the tent. Erika and Mike were great hosts and incredibly helpful settling us all in. The views were amazing and listening to nature during the evening was brilliant. Although the weather was shocking it still didn’t ruin our holiday. What a beautiful place Mike and Erika have….will definitely be back again. Wonderful cream Tea on arrival. The place is just so tranquil…..thank you….just what we needed. Lovely hosts and excellent glamping experience. Campion is a great tent for a family hols – we had a fantastic time. Campion is in an ideal setting and cleanliness is superb. If you are looking for a relaxing holiday this is the place to choose. The owners are very friendly and helpful. The local pub Elliott Arms serves excellent food and is dog friendly. Absolutely amazing ! Mike and Erika were welcoming, helpful at the same time we hardly seen them ! This was our first glamping and they have made it most memorable holiday ! Thank you ! Great fun – well worth a visit! Just the right amount of tents to make it sociable but not too busy. Perfect Glamping combination of toilet/shower/electricity which definitely gives it the glamp factor! We will go back. A fabulously comfortable glamp in the Cornish countryside. (Best scones ever!) Would definitely come again! Fantastic safari tent which owners had very carefully set up with all necessary equipment for a lovely stay. Great area with access to both North and south coasts . Owner recommended a great beach for rock pools. Had very good nights sleep due to good quality mattress. Able to sit out on the veranda and watch the youngsters enjoy themselves on the trampoline in the evenings. Would recommend. We stayed there for 6 nights recently and had the whole field to ourselves. Very relaxing & peaceful stay, which is just what we needed. Erika & Mike were perfect hosts, very helpful and friendly, but respected our privacy. Maisy their dog is a poppet. We didn’t make it to the pub, mainly because it is a good mile uphill, along a very narrow track. The safari tent has everything you need to have a BBQ or cook outside. Very comfortable beds. The tent is true to the photos, quite twee, lots of bunting & stencils, if that’s your thing you’ll love it. It would be a fantastic place to take children, trampoline & swings, plus a farm very nearby. We spent a glorious 5 days in our ‘Honeysuckle’ tent in June, the weather was more than kind and we had a fantastic holiday. 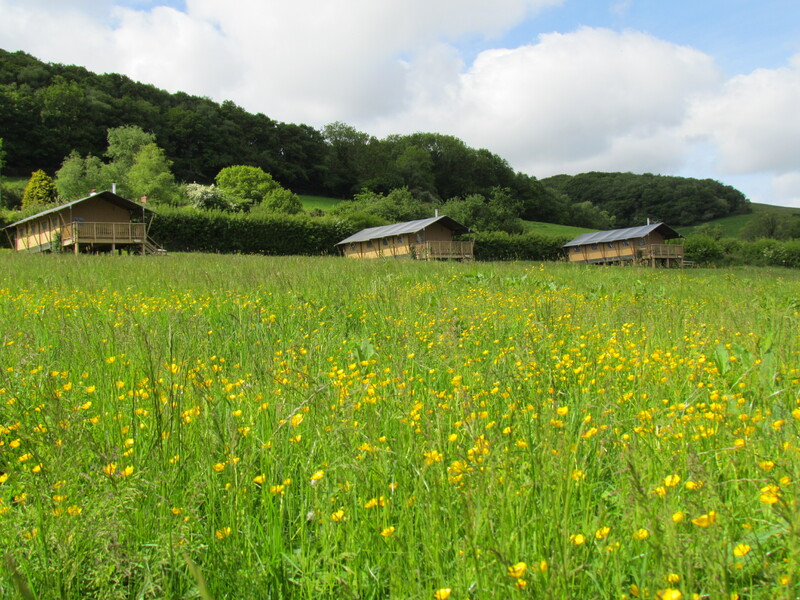 Western Meadows was an intimate and special place and everything had been thought about, glamping is definitely the way forward! Fabulous, peaceful setting. The tent was equipped to a standard you’d expect in a holiday cottage, absolutely superb. We stayed here with extended Family in Honeysuckle and Celandine Safari Tents. Our Hosts provided a well equipped and comfortable accommodation, nothing was too much trouble and were so helpful and friendly. Beds/linen and towels were of high standard. The honesty shop was well stocked and priced in line with supermarkets. The homemade scones with clotted cream and jam were greatly received and very tasty. The location was very tranquil and scenery outstanding. We used the fire pit to cook a BBQ. We stoked up the range to give the tent a cosy warm atmosphere. The stream was also used for a paddle by a few brave members of our group. We all left feeling totally relaxed and chilled. We highly recommend this to future “glampers”. A return trip is definitely a must. The safari tent was well equipped and in a fantastic location for sight-seeing and just relaxing in the tent. Mr & Mrs Buttriss were fantastic hosts, providing us with a warm welcome (including scones and clotted cream!) and lots of hints and tips on local beaches and places to see. Definitely a place we would like to return to at some point. We had a great time at Western Meadows. Mike and Erika, the Owners, are excellent hosts and have created a friendly and welcoming glamping site with all the facilities you need for luxury camping. The trampoline and play area were a hit with the children and they particularly loved seeing the friendly chickens. The communal fire pit by the riverside is a great place for sunset get togethers. New Mills Farm Park just across the road is a great little find and exceptional value for money and we enjoyed the steam train ride into Launceston for a look around too. Celandine was fully equipped with everything we needed, the log-fired range was brilliant for cooking and heating. The beds were so comfortable and there is also plenty of furniture provided to laze around inside and outside the tent. The en suite shower-room was fantastic – lovely hot water and inside the tent! We have a really lovely break at Western Meadows and would highly recommend a stay there. Campion is an excellent stay and far from your average camping holiday. A great central location, with the peace and tranquility you would expect from the countryside. I would recommend to all ages, families and couples and would love to visit again. The hosts are very friendly and cater to all your needs. Thank you so much for giving us a wonderful holiday. We had such a lovely time and appreciated all the things you’d done to make our holiday so special. The scones were delicious and enjoyed by all. We especially enjoyed cooking on the campfire (even in the rain on our last night!). We have all returned refreshed for the weeks ahead. A fantastic place to spend a holiday, great accommodation, friendly hosts, splendid location. We enjoyed our stay very much! The hosts were very friendly and very nice to work with! They even made us scones which we enjoyed very much! Thanks! Excellent location and choice, very peaceful and laid back setting, myself, partner and our kids thoroughly enjoyed our stay. This was a highly successful holiday for us all (a young family of 6). Living in the tent was both exciting and incredibly comfortable and the owners were fantastically helpful, going out of their way to ensure we were ok. There is lots to do around the area and we had a great week. We will definitely recommend it to friends, and visit again. The safari tents were well equipped, plenty of wood for the stove, they make an ideal destination for a group of families with the large field to play in and fire pit to sit around in the evening. We loved it. Perfect location and just a bit more than the average glamping tents with some electricity and a fridge – in our opinion a minimum for glamping, already thinking about booking for next year. The safari tent was very well equipped with everything necessary for cooking and barbecues, it was spotlessly clean and beautifully decorated. The owners were welcoming and very helpful, they brought us homemade scones and helped load up our bags and transport us back to our cars when we left in the pouring rain. Beautifully done. Was comfortable and had everything we needed (and then some!). The owners were friendly and welcoming. Only wish we could have stayed a bit longer. Mr & Mrs Buttriss where the perfect hosts welcomed us as soon as we arrived with fresh baked scones. The property was as per the pictures and even better in person we had a great break there and would come back later on in the year. Perfect location to relax and unwind but closer enough to have a great day out. Highly recommended family holiday, idyllic surroundings and the hosts were so friendly, a fantastic holiday was had by the whole family, cannot wait to book our next holiday there again! We had a fantastic stay at Western Meadows and it is in a great location with so many things to see and do in the area. It was also a lovely base to come home to at the end of the day. Our hosts were so welcoming and went over and above expectations to ensure we enjoyed our stay (complete with a tray of warm homemade scones fresh out of the oven!). I would highly recommend to anyone interested in glamping. A fabulous way to spend a week under canvas but with really comfortable beds and excellent showers. Ideal for families with children and dogs but great for walkers too, the location is great for countryside walks, places of interest and days at the beach. Kind and thoughtful owners provided a very comfortable and welcoming environment.